Today saw one of the lowest points in partisan media. In one of the worst displays of mainstream gutter journalism, led by Carli Brosseau from Oregon LIVE, who has attempted to senselessly slander the Bundys by digging through all the personal records and finances of the Bundy sons and other protesters, including their businesses loans, personal property records and even traffic violations – in a clear effort to try and slander them in public for matters not related at all to the public lands issue. If only the Oregon LIVE and CNN would apply that same level of effort to investigating the government’s role in Hammond case, or for the thousands of other farmers who have been forcibly bankrupted and put out of business over the last two decades. Amazingly, even long-established news organizations, such as the Washington Post, have published articles which question why the militia are not called ‘terrorists’, while Fox Radio ponders whether or not they are ‘patriots’ or ‘terrorists’. As seen toward the end of the clip, the true issue and fear for the establishment, as voiced through CNN’s television stars, is that people might see results from citizen movements with regards to a reverse order – of people controlling their government. If such an idea were to ever catch on, the people might actually believe that they own the country and public lands, and that would be intolerable. Proponents of a strong central government might fear that those who administer might return towards a “public service” model, as opposed to a federal service model. Part of the larger Department of the Interior (DOI), the Bureau of Land Management’s (BLM) Mission Statement is: “To sustain the health, diversity, and productivity of America’s public lands for the use and enjoyment of present and future generations.” According to the BLM website, they oversee more than 245 million acres and over 700 million mineral and “sub surface” acres, with a multi-billion dollar budget and about 10,000 employees. The BLM also claims to be one of the few federal agencies that generate revenue, based largely on 4.3 billion dollars of onshore oil and gas development and numerous other “land deals” brokered by the BLM. “There’s nobody in history who has gone to federal prison for burning a few acres of public property,” said Melodi Molt, a Harney County rancher and former president of Oregon CattleWomen. “It’s not right.” The Oregon Farm Bureau said the second prison term is “gross government overreach and the public should be outraged.” And then there is what some locals see as a government land grab. Next is the “Dirty Tricks” phase, where a third party leaks personal information of the protesters to the mainstream media, in order discredit the protesters and help to break up the group. Oathkeepers appear to have released another similar “insider leak” story last week for the Oregon Standoff, about the Pentagon deploying “Delta Force” to take back the Wildlife Refuge, which can be found here. In terms of discrediting the protest in the court of public opinion, the Hammond Protest could field no one better than tabloid media mascot, like Jon Ritzheimer of Anti-Islam protesting fame. Ritzheimer quickly become the mainstream media’s target of ridicule and used to discredit any of the other protesters. In addition to his armed march on American mosques, Ritzheimer also tried to grab headlines for traveling to Michigan to kidnap, or make a “citizens arrest” as Ritzheimer called it, of the elderly Senator Debbie Stabenow (D) – because she supported the international Iran Nuclear Deal. What’s more amazing is how Ritzheimer could threaten a Senator and also publicly incite a mass armed provocation against a single religious minority group – and not be arrested and at least placed on probation (taken off the street). Shades of the New Black Panthers? PHOTO: Professional media villain and provocateur Jon Ritzheimer. 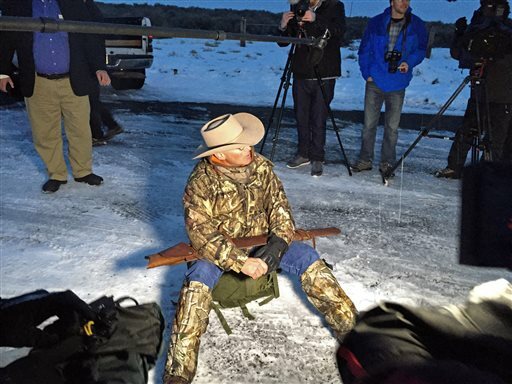 Another prominent militia personality at the Oregon protest is Blaine Cooper (also known as Stanley Blaine Hicks). Like Ritzheimer, he also acts as a media lightning rod – due to his similar performance in a YouTube video where he rubs bacon on a copy of the Koran before burning and shooting arrows in to it, before calling it, “the most evil, pathetic book on the face of the planet.” Unfortunately, these media distractions only divert the public from real issues being raised by the Hammonds and the Bundys and will ultimately be used to discredit their land rights cause. As the event unfolds many scenarios could happen. The worst outcome of events in Oregon would be that the Hammond family issue loses the spotlight, and the public lands issue becomes obscured by a media desperate for a anti-gun narrative and obsessed with the ridiculous antics of synthetic YouTube actors attached to event.